The classic 20- to 40-Clove Garlic Chicken recipe comes to chicken wings in one's slow cooker, but with a teriyaki vibe added. Nice! 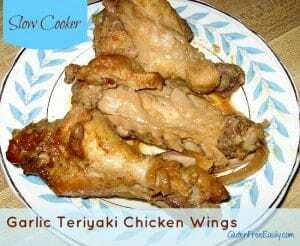 Place chicken wings in bowl and pour soy sauce over them. Marinate for as much time as you have available, even overnight. (I marinated mine for 5 hours, but you can marinate for far less time. I'd suggest at least two hours if your time is short.) Then discard soy sauce. In very large bowl, add olive oil, honey, paprika, black pepper, and garlic, mixing ingredients together. Add chicken wings and toss all together until chicken wings are coated. Pour all into crockpot, on top of the onion. Cover and cook on low for 6-8 hours, or on high for 4-6 hours. I cooked these chicken wings on low for 6 hours, then kept them warm for another hour. If you decide to cook other, larger chicken pieces, you will probably need the longer cooking time shown. The ingredients label on the store brand (Food Lion in this case---our only local choice) of frozen chicken wings shows chicken wings and seasoning solution. I've contacted Food Lion before and was told that the seasoning solution is water and salt. I believe that information because I do fine with these wings and eat them fairly often. Please ensure gluten-free status of all ingredients to your own comfort level. If you are serving more than two, semi-hungry folks, you'll want to double, or even triple, this recipe.